The schematic of an automatic cooler fan for audio amplifiers is given here. The circuit automatically switch ON the cooler fan whenever the temperature of the heat sink exceeds a preset level. This circuit will save a lot of energy because the cooler fan will be OFF when the amplifier is running on low volume. At low volume less heat will be dissipated and it will not trigger the cooler fan ON. The temperature is sensed using an NTC (negative temperature coefficient) thermistor R2. Junction of thermistor r2 and resistor R1 is connected to the inverting input (pin3) of IC1 which is wired as a comparator. The non-inverting input (pin2) is given with a reference voltage using the preset R3. As temperature increases the resistance of NTC thermistor will drop and so do the voltage across it. When the voltage at the inverting input becomes less than that of the reference voltage (set for a particular threshold temperature) the output of the comparator goes high and switches the transistor Q1 ON. This will activate the relay and the cooler fan will be switched ON. When the temperature decreases the reverse happens. LED D2 will glow when the fan is ON. Diode D1 is a freewheeling diode. The circuit can be calibrated by adjusting the preset R3. 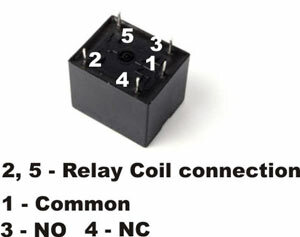 K1 can be a 12V, 200 ohm, SPST relay. LM311 must be mounted on a holder. Please help me with connection of Relay,. i tried a lot but either fan doesnt operates at all, or simply keeps operating w/o any effect of temperature,..
Also, does range of NTC be specific?? of any NTC will work?? This schematic is nonfunctional. Q1 can’t be turned ON because there is not positive bias. Pin 7 is the open collector of the output transistor(in LM311). Its collector should be tied to +V(12V) via a resistor (2.2kÎ©) in order to bias Q1 into saturation. Base of Q1 should be tied to pin 7(no resistor needed!!). And employ some positive feedback(hysteresis), otherwise the relay will chatter around trip point. Tie a resistor(100k…470kÎ©) from collector of Q1 to pin 3(inverting input!!!). what is the use of NTC thermistor? and how can we connect relay which has 5 terminals? plz give me the answer? Hi Pritvi NTC is negative temperature coefficient. That is if the resistance is exposed to heat its value will be getting reduced as the temperature increases. how many value ohm the ntc thermistor? Your automatic-cooler-fan-for-amplifiers circuit will not work as it is. The LM311 sinks the output when turned on. So change the value of R4 to 2.7k and add a 10k from the base of the transistor to +12V. Then it works good. help me for a relay circuit connection . what is K1 and what will it do? how many ohm the ntc thermistor? how to connect relay?? there are 5 pins? plz help. does the NTC thermistor connected to amplifier heatsink or something for sensing the heat, or just put it in on a pcb board? This is a closed loop as the temperature is the feedback information for the air flow. is this open-loop or closed-loop circuit? I access the site and get many supports what I want. Really it is a great web site for all. I like the site, because I can find every thing which I want. Another thing, how can you use spdt relay instead of spst? Thanks!